Clay pots are beautiful even though many find a whole range to be monotonous. In order to change clay pot’s look you could spray a moss and buttermilk solution that stimulates moss growth, which look great on terraces and outdoors. Instant gratification however is what most want and clay painting is fun, but coming up with clay pot painting designs are even more fun. You can draw inspiration all around you, places, objects, and people and set up design guidelines as you progress. When you paint terracotta pots for example that houses a green plant you will not paint it green. When you have a large pot you will avoid small, intricate designs. The design possibilities are endless and we look at the supplies you will need aside from your imagination. Take a tub large enough to hold your pot and fill it with warm water to soak the pot for no less than an hour before you scrub it down with the brush. It will have to be completely dry prior to painting and drying with a cloth will not suffice. Take the color of your base coat and pour it into a plastic plate before you thin it a little with water. You can now also adjust the base coat’s color to your liking and the water is added simply because you want the pot evenly coated with the watered down paint. 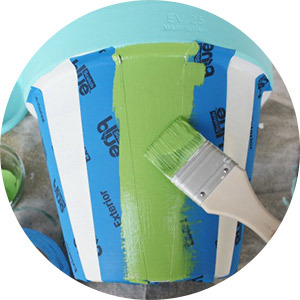 Take your foam brush to apply the paint using broad sweeps around the pot. When you reach the top of the pot you can extend higher and into the inside of the pot for about an inch. The bottom however must never be painted as you need it clear for drainage purposes when using it as planter. You will notice that clay pots absorb lots of the first coat of paint. You might want to add several more layers of base coat until you reach the desired depth of color.